When I was a kid, gradually entering the world of science through high school lessons in physics, chemistry and biology, I was very skeptical of almost all traditional practices that was common in our household. I sure enjoyed the numerous Hindu festivals and the delicacies that my mom prepared on these days, but I still saw them more as superstitious traditions than something with any scientific basis. For example, I thought it was superstitious of my parents and relatives to do pujas (Hindu prayer rituals) in honor of the sun, moon, the earth, tulsi (basil) plant, cow or even the cobra. After all, I had learnt through my science lessons that the sun, moon and earth were merely astronomical bodies, not really gods like they were denoted in some Hindu puranas (Hindu mythological stories). Similarly, tulsi was just a plant, cow a mammal, and cobra a scary reptile. So it had to be superstitious to worship them. However, now as an adult, I am gradually starting to understand and appreciate the scientific basis of many Hindu festivals. A week ago was Makar Sankranti, a Hindu harvest festival celebrated throughout India that marks the northward movement of the sun (Uttarayana), something that also has deep spiritual significance. But there has been a lot written about Makar Sankranti, so I will focus today on a relatively lesser known festival, because it is unique only to the state of Odisha. The festival is that I am talking about is very similar to Makar Sankranti in tradition and is called Samba Dashami, which this year fell on the 19th of January. As usual, my mom cooked several Odia delicacies, although the number of dishes were a litter fewer than usual because I insisted that she didn't strain too much when she was not keeping in good health. My mom (and I) then took a plate filled with these dishes and fresh fruits into the driveway of our home where there was direct sunlight, and we offered these food items to the sun (god). 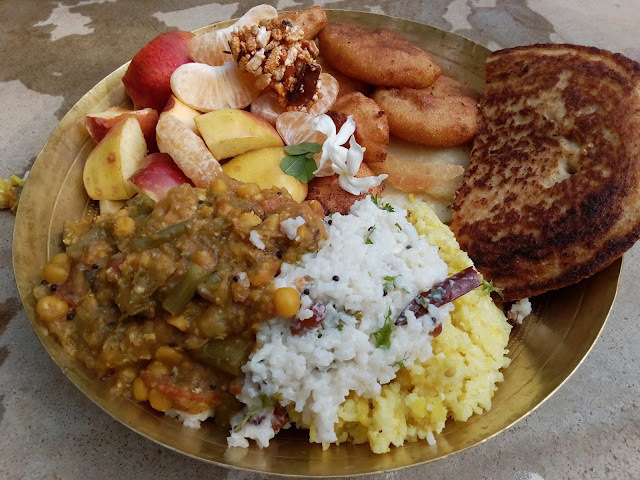 Just in case, you are not familiar with Indian traditions, no, the food was not wasted; once the offering has been made, we consume the food as prasad (food that has been blessed by a deity). Legend has it that Samba, one of the sons of Lord Krishna, was afflicted by leprosy, and he was cured of his disease by Surya, the Sun God, after 12 years of penance. So on Samba Dashami, the mothers pray Surya for their children's health. So what is the scientific significance of all this, you may ask. Well, I don't know whether or not sun can cure leprosy, but there is a lot of evidence for sunlight being good for our health, helping in the prevention of certain diseases, and even beneficial for patients of some diseases. For example, studies have found that vitamin D that is produced by the body on exposure to sunlight can fight breast, colon and prostate cancers. Studies have also shown that sun can help lower risk of multiple sclerosis, help with increasing bone density, be beneficial to patients with Alzheimer's and depression, help in healing of many skin diseases, including psoriasis. Forget these specific health benefits, sun is basis for all life on this planet earth. That way we owe our entire existence to sun. Without sunlight, there would be no plants, no crops, no animals, and consequently no us. So we have a lot to be grateful about with sun. The Samba Dashami festival is then essentially a way to express gratitude to sun. Through our food offerings, in the Indian culture we humbly express our thanks to all those entities to whom we owe our existence. And yes, even the cobra plays a big role in our existence. Without snakes—even deadly ones like the cobra—most of our crops would be lost to rodents. That I think is the reason why we have a festival in India which even honors cobras, not because we are afraid of cobras and seek protection from them, but because our ancestors didn't want us to kill all the snakes in fear of them. The extinction of snakes would be disastrous for us.